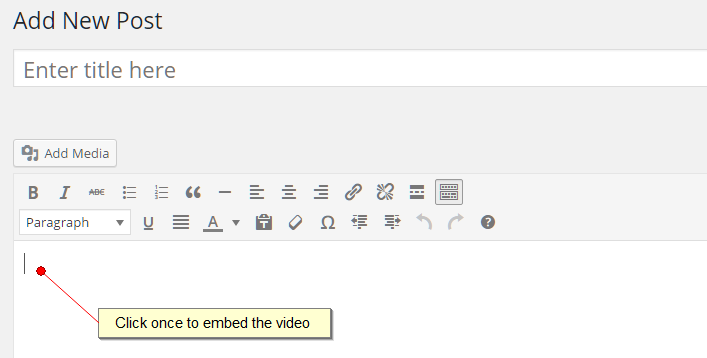 There are two ways to display video from your WordPress site, embedding and uploading. Embedding is the easiest method allowing to you place a video from popular video sharing services such as YouTube or Vimeo directly into your page or post. If you are running the latest version of WordPress. There are many advantages to this method as YouTube and Vimeo will be able to manage many of the technical issues associated with streaming video online more easily than your WordPress site can. YouTube and Vimeo can create multiple copies of your video, allowing them to stream your material in HD or on lower resolutions. They will also be able to detect your visitor’s Internet connection and device type and provide the most suitable quality for that particular visitor. Even the most sophisticated WordPress video plugin will generally not able to match the encoding options and streaming optimisations provided by these large commercial video streaming services. Video files are can be quite large in size and the bandwidth required to stream them to hundreds, or thousands of visitors, at any one time is generally beyond the means of most shared web hosting accounts. YouTube and Vimeo don’t suffer from these restrictions thereby allowing you to upload any number of high quality videos and stream them simultaneously to anyone without any performance impact against your web site. According to many independent web site rankings, YouTube is currently the world’s second most used search engine, and the third most visited web site. This factor alone encourages many web site owners to upload their videos to YouTube. By uploading a video onto YouTube along with a suitable description and a link back to your web site you can bring far more visitors to your site than you would otherwise by just uploading the video directly to your hosting account. 1. Locate the video that you wish to embed from YouTube. Select the URL from within the web browser address bar and copy it. 2. Create a new page or post within WordPress and click once into the empty body area. 3. The video will now appear embedded into your post. 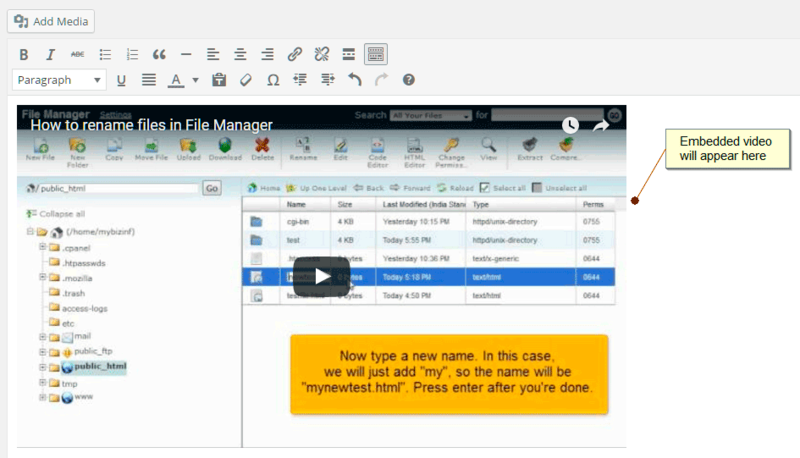 The other method of adding video is to upload your files directly into WordPress from your local computer. 2. The Insert Media screen will appear. Click on the Upload Files tab and then click on the Select Files button. Select the video file from the appropriate location and then click Open to continue. 3. The video will now appear embedded within your page or post. Most modern web browsers that support the HTML5 video element will display a set of controls allowing the visitor to control playback. Older web browsers will just show a link allowing the visitor to download the file. If you are looking to support older browsers or would prefer a more sophisticated set of controls and video format support then a dedicated video plugin for WordPress would be the way to go. There more basic plugins just provide more advanced playback controls and responsive design support. Advanced plugins requiring payment will provided you with video galleries, format conversion and optimisation options and the ability to upload files to a third party Content Delivery Network (CDN) for faster delivery. WordPress provides limited controls over the size and appearance of an embedded video. The Responsive Video Embeds plugins automatically resizes WordPress auto-embeds, including video and other iframes, in a responsive fashion. This plugin is particularly useful if have already incorporated a responsive design into your web site or you have receive a lot of mobile traffic. If you are happy embed video files from your YouTube account but would like to be able to create simple galleries and thumbnails then this plugin will be an ideal choice. Display latest thumbnail videos from YouTube user channel playlist. When you click on one of the thumbnails the video plays on player. You can choose to use this plugin as a widget or as a short code. WordPress Video Gallery is a commercial plugin providing a complete video sharing and gallery solution. Using this plugin you can create your own mini YouTube or Vimeo platform allowing you to upload, tag and sort videos into categories. Advertisements, custom branding and social media sharing are also integrated. All of the popular video formats including FLV H.264 encoded video including MP4, M4V, M4A, MOV, Mp4v, F4V video formats are all supported however there is no option to upload files to a third party content delivery network (CDN). If you are using Vimeo instead to manage your online video then the Vimeography WordPress plugin will be the perfect choice. This plugin will allow you to easily add videos uploaded to a Vimeo user account, channel, album or group. You can create galleries on a page, post or template with the built in gallery helper or using short code. 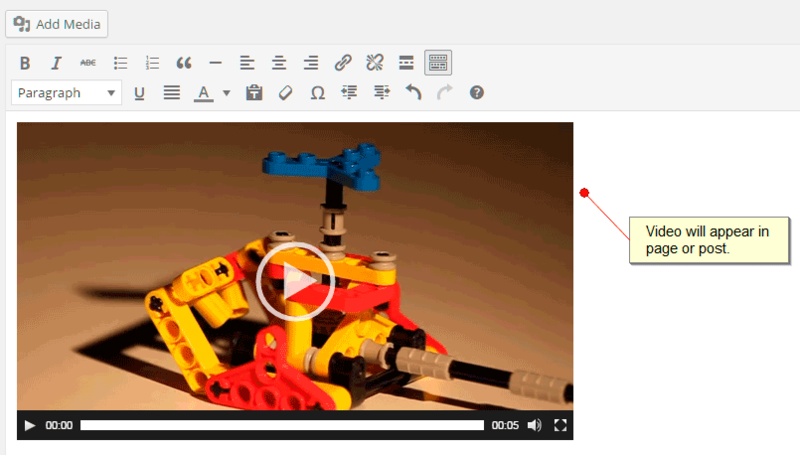 Galleries can contain a featured video, and each gallery can be customised with its own theme using the built in editor.